We’d love your help. Let us know what’s wrong with this preview of Love by Stacy McAnulty. What is love? Can you only express it in fancy meals, greeting cards, and heart-shaped chocolates? Kids will find love everywhere in this delightful book. It can be found in everyday moments such as baking cookies with grandma, notes from Mom in your lunchbox, or a famil From award-winning author Stacy McAnulty comes a sweet story about love and what it's really all about. To ask other readers questions about Love, please sign up. A simple story with a very simple, yet powerful message for beginning young kids 2-4. I very much enjoyed the artwork in this. It is really a little too simple, but what is here does ring true. Love is the simple things that we can all do. The niece said this was for babies and gave it 1 star and the nephew thought it was young too, but he gave it 3 stars. Stacy McAnulty's book about love shows that love is in everyday things....in our actions, words and caring for others. The illustrations carefully teach a lesson that love has nothing to do with a commercialized holiday....and everything to do with how we value those around us. Lovely book! I'm ordering a copy for my grand kids! The Illustrations by Joanne Lew-Vriethoff are beautiful! Colorful, interesting and meaningful! The cover art pulled me in and got me to read this children's book. I'm glad I did....it really has an awesome message! I think my grand kids will really enjoy it! This is the first book by Stacy McAnulty I've read. She has several others that Joanne Lew-Vriethoff also illustrated. I'm sure I will be reading and buying more! There are so many ways to show love and kindness to others. McAnulty continues her BRAVE and BEAUTIFUL books with one that focuses on love and how to share it in the simplest ways. Love can be a fancy dinner, even if it is just for your dog, some artwork for a teacher, sharing a chocolate chip while making cookies, or that first hug with your new baby sister. Love comes in many forms and is shared in many ways throughout our days. This simple book is a wonderful way to teach our youngest childre There are so many ways to show love and kindness to others. McAnulty continues her BRAVE and BEAUTIFUL books with one that focuses on love and how to share it in the simplest ways. Love can be a fancy dinner, even if it is just for your dog, some artwork for a teacher, sharing a chocolate chip while making cookies, or that first hug with your new baby sister. Love comes in many forms and is shared in many ways throughout our days. This simple book is a wonderful way to teach our youngest children the importance of sharing love and kindness with others and how easy it can be. The illustrations share a diverse group of children and adults from all races and abilities. There are children with glasses, in wheelchairs, with hair and without. What I loved most about the illustrations though is the joy that is expressed in the faces of both those giving love and receiving it. The love shared by giving of our time or gifts is obvious and is an easy way for kids to begin to understand the importance of empathy and sharing love. I even loved the illustration of a kitchen. It wasn't a perfect kitchen. There were lists, school papers, and homemade artwork hanging up. The counter was messy while cooking. I appreciated the realistic image of a family kitchen which makes the kids able to fit in and see themselves doing some of the activities in the book. Shortly, Valentine's Day will be front and center and kiddies will be filling out little Valentine cards for classmates. Sweethearts will rack their brains to find a special way to show their "love" for their sweetheart. Husbands will descend upon florists, sellers of chocolates, and card displays hopeful of getting the just right item to tell their wife he loves her. And the story of love and Valentine go on and on. But just what IS LOVE, really? The author and illustrator have shown in this bea Shortly, Valentine's Day will be front and center and kiddies will be filling out little Valentine cards for classmates. Sweethearts will rack their brains to find a special way to show their "love" for their sweetheart. Husbands will descend upon florists, sellers of chocolates, and card displays hopeful of getting the just right item to tell their wife he loves her. And the story of love and Valentine go on and on. But just what IS LOVE, really? The author and illustrator have shown in this beautifully executed children's picture book what love is. And the gist is that love is being nice, being kind, giving a card, sharing some flowers. And it all boils down to the joy and happiness that is shown in the expressions of the characters as they go about showing their love. ...... Because nothing else matters without love. It can be seen every day. The illustrations are charming. They capture the very heart of love (pun definitely intended). From "Facetime" video hugs from a mommy afar off in the military to two children communicating in sign language. The book exudes joy, happiness, and - yes - love. 💖💝 Why not purchase one for your child or a grandchild? Expressing love can be done in so many ways. This colorfully illustrated story has kids from every walk of life sharing how they show love to someone in need and especially for someone they care about. A young pup gets a fancy meal served with a flower. A girl gets art drawn on her cast and a diverse family share a sing-a-long in a car. There is more to love than we can ever imagine and when it’s shared it makes people feel happy and they know they are not alone. This story is great for beginner Expressing love can be done in so many ways. This colorfully illustrated story has kids from every walk of life sharing how they show love to someone in need and especially for someone they care about. A young pup gets a fancy meal served with a flower. A girl gets art drawn on her cast and a diverse family share a sing-a-long in a car. There is more to love than we can ever imagine and when it’s shared it makes people feel happy and they know they are not alone. This story is great for beginner readers. Parents and caregivers can share this story of love with young listeners and create an activity with art so they can share their expressions of love with the people they care about. 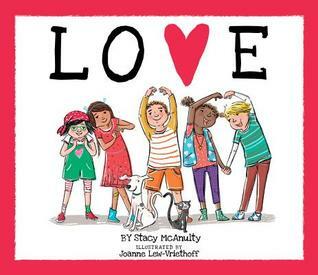 Stacy McAnulty’s LOVE is an absolutely beautiful and timely picture book that celebrates the power, beauty, and grace of love in all its forms. With the sweetest and simplest prose McAnulty manages to convey so much goodness and heart. Lew-Vriethoff's illustrations perfectly capture the book’s huggable sentiments and feature such a lovely diverse cast of characters. Readers of all ages will be delighted by LOVE and moved by his heartwarming message. I love Love LOVE this book!!!!!!!!!!!!!!!!!!! I received a free copy of this book from the publisher in exchange for an honest review! I was happy t I received a free copy of this book from the publisher in exchange for an honest review! Disappointed. Not sure why. Perhaps illus did’t turn me on. Perhaps I was put off by the phrase Love needs special presents and designer greeting cards. All I could think of, was that the key to love was that it didn’t need anything. The illus were so inclusive that they seemed forced. I did like the illus for Love comes in the shape of a heart. Sorry because I usually LOVE Stacy McAnulty. Hello, friends! Our book today is Love, written by Stacy McAnulty and illustrated by Joanne Lew-Vriethoff, an ode to ways of feeling and expressing love. What is love? What does it look like? Like a fancy meal or a designer card? Is it expensive gifts or fancy dinners? What do we mean when we say it happens at first sight? And how can we express it to the people who matter to us? A gloriously diverse cast of characters show the reader that love comes in many forms, and that there is no way too bi Hello, friends! Our book today is Love, written by Stacy McAnulty and illustrated by Joanne Lew-Vriethoff, an ode to ways of feeling and expressing love. What is love? What does it look like? Like a fancy meal or a designer card? Is it expensive gifts or fancy dinners? What do we mean when we say it happens at first sight? And how can we express it to the people who matter to us? A gloriously diverse cast of characters show the reader that love comes in many forms, and that there is no way too big or too small to show someone we love them. Fabulous. As with their previous books Beautiful and Brave, McAnulty and Lew-Vriethoff expertly utilize the convention of making broad statements in the text then subverting them with the illustrations: “fancy dinner” is a lovingly-prepared bowl of food for an injured pet dog; a “designer greeting card” is a child’s joyously expressive crayon drawing; “first sight” is an adoptee being greeted with signs and grins by their new blended family. Especially striking is the tremendous diversity of these characters: adults, children, elderly, differently-abled, hearing-impaired, different faiths, different versions of non-traditional families, all in a rainbow of skintones that create a story world as vibrant as our own. The love is equally as diverse, showing the love we have for family, friends, pets, neighbors, or even total strangers. It’s an uplifting and affirming reminder that love colors our lives in every way imaginable, and is something we all share, and has infinite means of expression. The length is great, JJ loved it, and we can’t recommend it enough. Baby Bookworm approved! Perhaps a bit sentimental, but fairly inclusive and with a positive message when read cohesively. Caretakers reading the book to young children will have a lot of opportunity to talk about the text of the book as opposed to what is happening in the pictures. When I first approached the book I assumed I was going to find it trite, and I was pleasantly surprised with the book and its message of love. I would certainly consider using it for a story time. Major LOVE for this book by @stacymcanulty! I LOVE how the illustration don’t match the very typical (and somewhat cliche?sometimes consumeristic?) idea of showing love. This is the perfect book for Valentine’s Day ... and for helping kids recognize and give LOVE in many regular ordinarily awesome ways! Love pales in comparison to McAnulty's previous title, Brave. Though Love follows the same format as Brave, some of language and the corresponding illustrations aren't as cohesive or comprehensive as they could be. I received the link to read this beautiful children's book online today. It's so precious and so sincere I couldn't help but post the review immediately! The words are sweet but it's the wording and illustrations combined that make this such a special book. I loved it so much, I scheduled my review for it, on my website, for Valentine's Day. What better way to share it? I love how this book takes a new look at Valentine's Day norms - a fancy dinner for you dog, designer greeting cards made by creative little ones, and hugs sent via Skype to a deployed parent. I'm looking forward to sharing this with my Toddler Storytime tomorrow. It may be more for the caregivers, but that's okay too! I love the message of this book. Love comes in all kinds of shapes and sizes and is shared with all kinds of people, be they family, friends, neighbors, or pets. This book made me cry! What the heck, that was so cute. The book showcases adorable, simple, specific ways that people can show they care about each other. The sister getting adopted! The skype call with a military family member! My poor heart! This simple toddler and up book was just awesome! It talks about love and ways it can be found and where it can be found but it's the diversity of the illustrations that get you from the new adopted sister being welcomed home to the military parent being video conferenced. A timely read. This book is beautifully illustrated with a wonderful message. Simple, eye-catching, and a good read both at bed time and in the classroom. A simple yet powerful look at the many faces and displays of love. Really choked me up. Wonderful book. Show and share your love, everyone. This book shows how you can show love to other people. Love can be a fancy dinner or a hug good night. You can show love if you are black or if you are white. You can get love from a mom or dad, or from two moms or two dads. You can show love with your words or with sign language. The important part is to show love to the people that matter to you. This book is perfect for the Valentine’s time of year but it’s really a great fit for any time of year. LOVE, by Stacy McAnulty, is a sweet and simply stated book all about the ways we can share love with the people in our lives that we care for. It puts into words all of the wonderful things that make love just so lovely. Vibrant illustrations from Joanne Lew-Vriethoff are the perfect touch to really bring the words to life. Thank you t This book is perfect for the Valentine’s time of year but it’s really a great fit for any time of year. "More than paper hearts, chocolates, and flowers, Love is a gift that cannot be wrapped." This simple text and bright colorful illustrations will be great for a Valentine's Day storytime, or any day you want to talk about love! Such a good book, with an amazing theme. Our youngest students will love this book! Seemingly simple, but requires some pondering. I think kids will have a lot to say about this book. Simple message with sweet illustrations. Super sappy and absolutely lovely. I am blinking back tears at the desk at work. Ahhh...toujour l'amour! I loved the gentle teasing tone and how the author takes Valentine tropes and turns them sideways for a look at what really makes something LOVE. This book is cute, but the sad puppy at the beginning got my mood day. Poor thing. A cute book about love in all forms.